It’s morning in Maine, and Margaret Hathaway has already milked the goats in the back yard and fed the chickens. Four-year-old Beatrice colors in the dining room, baby Sadie is napping, and big sister Charlotte is at kindergarten in Portland. By the time I find my way to Ten Apple Farm in Gray, Maine, the chévre is cooling in its triangular molds, and the Manchego is simmering on the front burner. “You have to slowly warm the goat milk to 86 degrees,” cheesemaker Hathaway says, whisking figure-eights calmly in the big pot on her kitchen stove. Pushing back her bandanna, Hathaway takes a quick look at the clock. It’s time to add in her culture packet — a microbe-rich mixture of rennet, culture and salt. 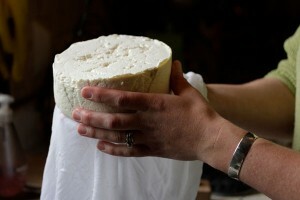 “Making cheese is really straightforward. All it really is is good, fresh milk — ours comes straight from the goat and is unpasteurized — seasoning and culture — and patience.” This morning, Hathaway is a little worried about her cheese. She made bread earlier in the morning, and it’s conceivable that the microbes from the yeast in the bread may have hijacked the microbes in the cheese culture. “Making bread and cheese at the same time is considered a no-no in cheesemaking, but I wanted bread for lunch,” she says. So, we eat lunch and wait — a goat cheese quiche with fresh spring herbs and home-baked bread — and keep checking to see whether the Manchego explodes instead of condensing when it comes time to put the milk in the cheese press.